Seattle’s rash of sidewalk and lane closures is expected to get worse with more construction coming next year. Officials are trying to modernize policies, staffing and technology with lessons from other cities to minimize growing pains. Lawrence Slater sits on the bus from Ballard to downtown some mornings stewing and searching for answers. Construction of new buildings near South Lake Union closed one of the Westlake Avenue’s two inbound lanes for a short stretch, leading to a long, creeping merge of rush-hour traffic. “I can’t tell my boss I was stuck on Westlake for 25 minutes. It doesn’t fly,” Slater said. The delay is all the more aggravating because Slater found a city website that said the closure in front of 1101 Westlake Ave. N. was expected to end Oct. 26. A few days before Christmas, the lane was still closed. As Slater’s bus crawled by on recent morning, the closed lane appeared to be used for parking a few trucks. He thinks Seattle can do better. His Route 40 bus is supposed to be improved to a RapidRide corridor, with the recent voter approval of a $930-million-tax levy. But “all the transit funding in the world isn’t going to do any good if you allow developers to needlessly clog the streets,” Slater wrote in an email to City Hall this month. City officials acknowledge they weren’t quite ready for the intensity of the current building boom, which is projected to increase next year. In the next few weeks, the city expects more than 70 sidewalk, street and parking-lane closures just in downtown and South Lake Union. The job of updating policies, practices and staffing for sidewalk and street closures falls to Brian de Place, the city’s street-use chief. His job is not so much to make the problems disappear — because they’re a symptom of growth the city has courted. His task is to minimize the growing pains and modernize Seattle’s way of dealing them by learning from other cities. Taking lessons from New York City, de Place and the Seattle Department of Transportation (SDOT) have mandated meetings with builders in hot spots like downtown to get a look ahead and better coordinate work. That way, Fifth Avenue isn’t closed for a delivery of steel beams the same day the viaduct is shut down for a state safety inspection, said Ken Ewalt, an SDOT construction coordinator. Taking another cue from New York, de Place is hiring more inspectors and equipping them with electronic tablets so they can do more work from building sites. Like New York and Toronto, Seattle is aiming for stricter enforcement, including stronger sanctions, and plans to post details and photos of rule-breaking by contractors. Those postings were supposed to start in 2015’s last quarter. They haven’t yet. On Christmas Eve, the day after a reporter asked SDOT about the closed lane at 1101 Westlake Ave. N., barriers at the site were removed and the lane restored. The closure permit was no longer in effect, an SDOT spokesman said. Jerry Dinndorf understands the frustration. His office as district manager for the Associated General Contractors of Washington is just across Westlake Avenue from the closed lane that slowed Slater’s bus. Dinndorf has been caught in similar jams. 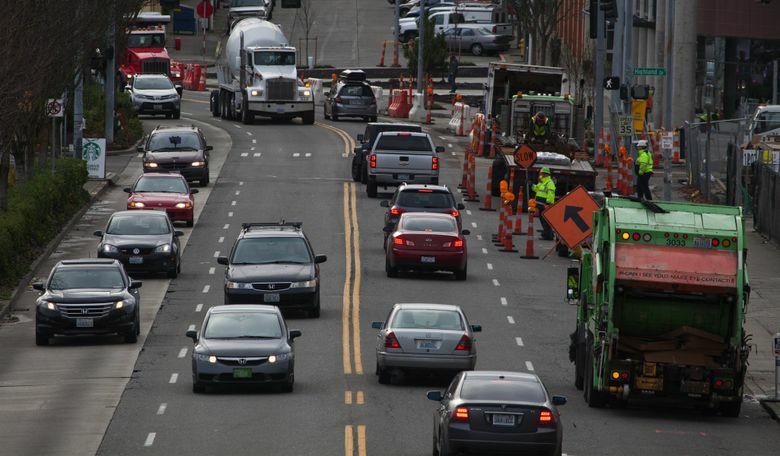 Contractors have no choice but to use lanes in most projects near downtown Seattle, he said. There’s no way to deliver materials like concrete without doing so. Because Seattle allows construction right up to the edge of lots, de Place said, there’s often no other place for staging a project. The city has said no, at times, according to de Place. Contractors wanted to close all of Yesler Way for a recent project, he said. That was unacceptable, he said, so they worked out a deal to close just one lane on a rotating schedule. A hotel project near Howell Street and Eighth Avenue is another example. “Because previous closures had significantly impacted the adjacent day care, we worked with the contractor to find a different location to keep Eighth Avenue open,” he said. What residents and commuters often don’t see, Ewalt said, are the restrictions the city does impose on builders. They don’t know about the late-night concrete pours ordered to minimize traffic and business disruption. They rarely notice the orange barriers that get pushed back to the curb during rush hour so lanes can reopen to traffic. SDOT Inspector Benito Gonzalez said he has stopped work when contractors aren’t adhering to their permits. But he said the city tries to work with builders to gain compliance, not punish them. Under the new policy, a first violation will lead to a warning and inspectors will stay on-site until the problem is addressed, or they may follow-up in 24 hours. A second violation leads to a $250 fine. A third warrants a $500 fine. A fourth can lead to a stop-work order and $500 per day penalties. A fifth could spell a legal injunction to cease work. The city has collected about $60,000 in fines this year, de Place said. The city has also increased fees related to closing a lane, which are intended to recover the costs of inspections and oversight. The fees escalate over time and run higher for arterial streets. Two full-block Amazon projects will each pay more $1 million in fees, Ewalt said. In all, the city expects to collect $30 million in such fees this year, de Place said. That will allow the hiring of 36 new employees, he said, in addition to the 20 brought on this year, as SDOT tries to bounce back from recession-era staffing. Leftover fees can be used for community projects, de Place said, such as rainbow-painted crosswalks on Capitol Hill. In his hierarchy, de Place said pedestrian safety is his top priority. SDOT just adopted a new rule making sidewalk closures a last resort. It also calls for crash-resistant barriers to protect pedestrians, with warning lights and kickboards, which the visually impaired can feel with their canes. The changes were applauded by Cathy Tuttle, executive director of Seattle Neighborhood Greenways, which advocates for safe walking and biking. The last-resort rule is particularly important, said Gordon Padelford, a member of the city’s Pedestrian Advisory Board, with more Seattleites commuting by foot. Tuttle worries the city will still not have enough inspectors, and it risks disappointing the millennials who make up much of her organization. Seattle’s growth has put pressure on de Place’s team to up their game, said Mark Hallenbeck, director of the Washington State Transportation Center at the University of Washington. “Now the transportation guys are behind the eight ball,” he said. Michael Wells, the former executive director of the Capitol Hill Chamber of Commerce, said construction-related closures have been a problem for merchants in his neighborhood for years.